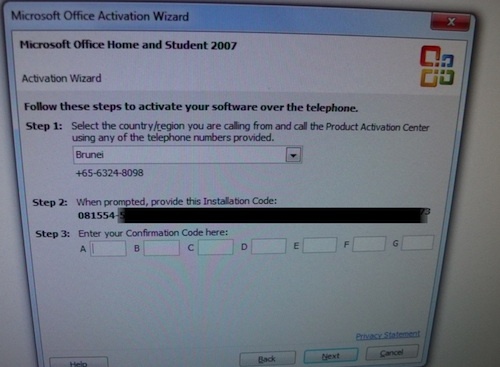 Microsoft Office Phone Activation Fail. Proxy server WIN! So as I recently got a new family desktop I was setting things up and had to install Microsoft Office. 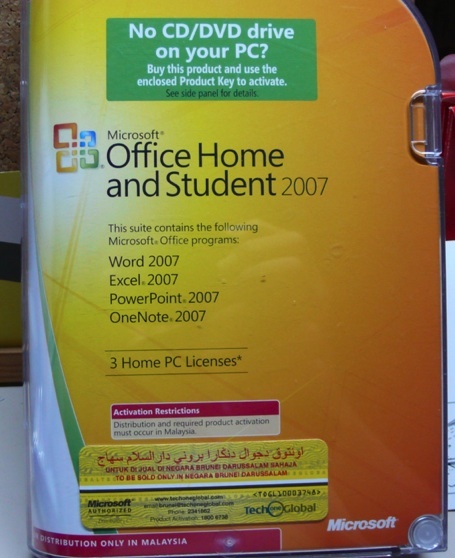 I bought a copy of Microsoft office earlier this year and thus proceeded to do the activation. I proceeded with the phone activation and spoke my Installation code for verification. It could not recognize the third group of numbers. Very well. Fine. I will just type it in. Same problem! In my frustration I tweeted that this is why people pirate software. Make a legitimate user feel like a prisoner enough times and they will want to run away and pirate. Luckily the sorry does not end there with me cursing Microsoft and product activation. On the box it does say that activation must occur in Malaysia. So I Googled for a Malaysian proxy, configured Internet Explorers to user a proxy (Tools > Internet Options > Connections > LAN Settings > Proxy server) and tried online activation and viola! Activated without any other problems.